Virginia Woolf is one of my heroes, whom I discovered on an English Literature degree introductory module, during which I read To the Lighthouse, but wasn’t particularly impressed with at the time. It wasn’t until I discovered her essays, and learned about the context of the times in which she lived, that I was hooked. Like pieces of a puzzle rendering a vague image gradually clear, the more a level of consciousness I had not been able to articulate found expression. I took an exam and picked my question based on her quote about the experience life being comparable to a luminous halo: consciousness flickering. I read Mrs Dalloway for my second year modernism module and A Room of One’s Own for one called ‘Images of women’. Her dazzling narratives represented so well the vagaries of consciousness, and her non-linear representations of time expressed what I had only bluntly grasped. Her calm and reasonable – but nevertheless impassioned – essays in defense of, and for the advancement of the rights of women, thrilled my soul. I finally understood why I had always suspected it would have been much better to have been born a man. It was because of Virginia Woolf – and the lecturer who introduced her to me – that my intellectual awakening occurred. 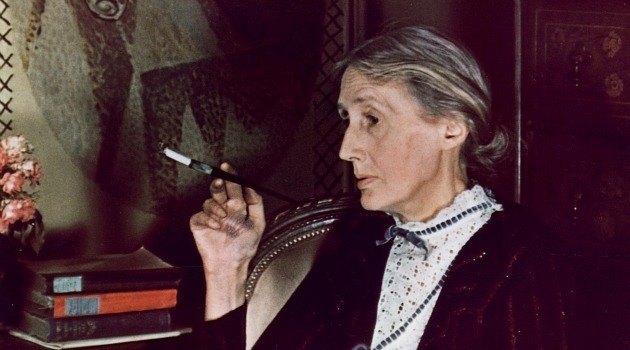 Virginia Woolf came into my life as part of a wider context of higher education, but she has never left it. She is an inspirational light which continues to shine through the decades. I included Mrs Dalloway in my undergraduate dissertation, which was about representations of the tea table in modernist literature, and how it symbolises the confinement of women but also may provide a route to their liberation. In my Master’s thesis, I wrote about all of her fiction and their explorations of women’s issues through tea. It was awarded a 2:1, and I can now proudly say that I have read all of her novels. So, though I already know a lot about her, the exhibition was fascinating because it provided a complex and insightful window into her personal relationships, the places she lived, and her art. Her work suffuses London, where she spent much of her life, where I now live, and where the exhibition took place. Her work is still relevant and I have yet to discover a modern feminist writer that matches her; though I live in hope. It provided a valuable new lens through which to view a most mysterious woman and her legacy. If you would like to see the exhibition, it runs until 26 October. I will try and catch up with the exhibition. Thanks for the post. Love the blog! Half personal, half insight into a 20th century heroine. Women could certainly do a lot worse than follow her own example! She was as much a beacon of modern thinking and artistic cultivation as any of the men in the ever-inspiring Bloomsbury group. Thanks, James. I picked the image of Woolf smoking and with books in the background because I thought it suitably encapsulated her bohemian, intellectual lifestyle. I forgot to mention the Bloomsbury group, but indeed, they are all inspiring in different ways. If only we had modern groups of intellectuals in the public sphere, instead of ‘Disney Club’ over-grown child stars, or cliques of filthy-rich actors.